Designed for babies who need just that bit more coverage, this special baby wetsuit is fleece-lined and has longer arms and legs. Made of super soft fleece lined material which it is uniquely designed to block in barrier cream for those who require it and is great for babies with sensitive skin conditions such as Eczema. The Warm in One wetsuit is a must for extending pool time for babies that are sensitive to cooler pools and ease the transition to chilly changing rooms.Awarded GOLD by Bizzie Baby baby reviewers 2011/12 and 2012/13! FunSwimShop UK was established in 2007 and we have more than 20 years experience in the swimming industry. Our aim is to become the number one website for swimming equipment, baby swimwear and swimming gear. Our focus on superior customer service and FREE delivery has allowed us to expand our product range to include wetsuits, swimsuits, swimming pool games, pool toys, beach toys and so much more. If you're looking for a snorkel, swimming goggles or flippers and swim fins online, compare us to other baby swimming shops, online swimwear and online swim shops and online surf shops. 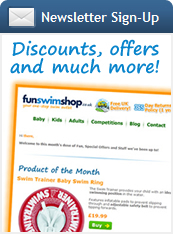 You'll find service with a splash plus a great selection of online shopping at FunSwimShop UK! Use of this site is subject to express terms & conditions, which prohibit commercial use of this site. By continuing past this page, you agree to abide by these terms. Contact us on 01628 529206 for help and assistance © FunSwimShop UK, Mailsports International Ltd. Price includes VAT (where applicable).